This deal is “reminiscent of the kind of deal I would have seen in 2006 and 2007.” They’re still blowing off the Fed. This is considered a door-opener Leveraged Buyout (LBO): If it flies and investors buy this $13.5 billion pile of deeply junk-rated debt today, even riskier and bigger LBOs may fly. It’s the fourth largest LBO since the Financial Crisis and the ninth largest of all times in the US and Europe: Thomson Reuters Corporation is separating its largest division, the financial information, analysis, and risk businesses, now called “Refinitiv,” to sell a 55% stake to a group of investors led by private equity firm Blackstone Group. This being a “leveraged” buyout, the Blackstone consortium is making the target company, Refinitiv, borrow in total $13.5 billion to fund most of its own buyout. This consist of $9.25 billion in “leveraged loans” and $4.25 billion in secured and unsecured bonds. Some pieces are denominated in dollars, others in euros. This debt sale is being completed today. The Blackstone Consortium will infuse $3.025 billion in cash equity. Thomson Reuters will retain a 45% stake and will receive a special dividend from Refinitiv of approximately $17 billion, according to Moody’s. And there are some other details involved. Moody’s also rates the loans and bonds being sold today, ranging from B2 to Caa2 for some unsecured bonds, which is eight notches into junk, and just three notches above default, considered “extremely speculative” (here’s my cheat sheet for corporate credit ratings categories). Seeing strong demand for this debt, Refinitiv on Monday increased the size of the debt sale by $1.25 billion and lowered the proposed yields on all but one piece. For investors, this means even more risks (more debt piled on the company) at even lower yields for investors. But hey, these are the good times. OK, but weak covenants have become a pandemic. 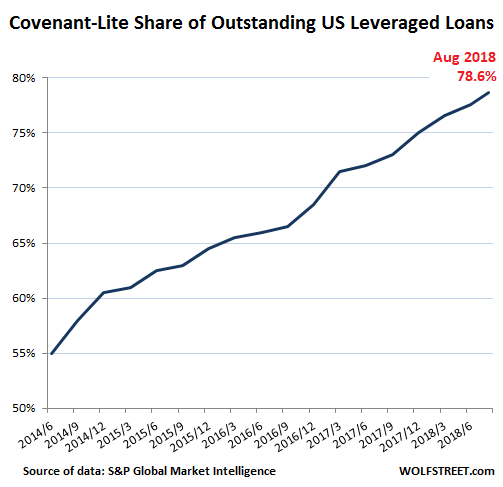 Companies issuing leveraged loans love weak covenants, and creditors will rue the day, but for now everything flies. Cov-lite loans give weaker protection to creditors (the investors), and in case of default, will hinder recovery and increase the losses. In Refinitiv’s debt package, $9.25 billion are leverage loans. But investors are going for it. It’s party time. And limited EBITDA growth prospects near-term. The pro-forma total debt-to-EBITDA ratio (a debt-to-cash-flow measure, where cash flow = earnings before interest, taxes, depreciation, and amortization) will come in at about 7.6x, according to Moody’s. Debt being 7.6 times the size of annual cash flow is high – and very risky for lenders. In 2013, US bank regulators, including the Fed and the OCC, started to crack down on banks about underwriting leveraged loans for deals whose debt amounted to more than 6 times EBITDA. This was a lesson learned from the Financial Crisis when banks got stuck with these leveraged loans and weren’t able to unload them to investors, as they usually do. But under the new pro-banking regime, regulators have backed off, and the 6x has been relegated to a nonbinding guideline to be ignored at will. And the company’s “EBITDA margins are below peers, suggesting the absence of pricing power and limited ability to achieve meaningful share gains,” Moody’s says. But none of these fundamentals matter to investors. These institutional investors – such as pension funds, insurance companies, loan funds, etc. – are eager to buy this debt to get some extra yield, no matter what the risks or consequences, because the party must go on. And this type of investor behavior only encourages the Fed to continue to raise rates until financial conditions in the market tighten enough to let the hot air out of these kinds of exuberantly risky deals. The soothingly low mortgage delinquency rate is a deceptive indicator: the New York Fed weighs in. Read… What Can Cause the Next Mortgage Crisis in the US? Are the pension funds counting on a political pressure-driven bailout, if their millions of beneficiaries see their pension funds wiped out? Interesting question. I suspect the fund managers are not planning on a guaranteed future bailout. However, I do believe the massive risk-on environment in which we’ve marinated for years and the coordinated global yield suppression have so blunted the fund manager’s sense organs that yields like this seem reasonable. Comes to the same thing, at least in terms of behavior! That would be the right thing to do for once but I fear it won’t be this time. Nor will it ever come without a new financial ideology from the publicly traded private banks, that are euphemistically ;) called the Federal Reserve Bank. “Federal” should be thought of, in this instance, as a brand name. Like Federal Express, who are also responsible for the interests of their shareholders. Long long story short version is that bank and private sector losses will be socialized while their profits are privatized. Will they engineer a soft landing or a crash? You might tak a look at the coverage of CalPers at Naked Capitalism Blog to get an idea of just how poorly run some major pension funds are run. Any reasonable person would not buy this trash. It begs the question, who would? And why? As I see it, Thomson/Reuters makes off like a bandit with 17B, while Blackstone pays 3B for a 55% stake, and gasp…no special dividend. Is it just to convince “investors” that this is not a complete scam, or in case of institutional, cover their behind? And who is going to blame the fund mangers when the gurus of finance maintain the economy is strong and no ripples anywhere. Just open some MSM finance site; trivia and roses. I could see this scenario playing out on another planet in a science fiction thriller. It’s only been 10 years ago when reality last struck! This so obviously a turdball that one has to ask what’s the secret quid pro quo for Blackstone? 7.6x leverage off of an EBITDA definition that is probably 6 pages long and includes 35% addbacks and adjustments – what could go wrong? And with no covenants, by the time the lenders can get their hands on the firms to restructure, they will be all but insolvent, so there will be less value to recover for even secured creditors. This merry-go-round will stop spinning eventually, and you’ll see those investors who are reaching for yield here get burned (and it wont be the banks this time around). Who knows how it will turn out, but it feels like ’07 in basically every asset class. Do I have this right, Reuters is selling the part of the business that is probably making money (financial data generation) and keeping the news division which is probably not making any money? Opps, I don’t mean to imply this sounds like a stupid idea. Reminds me of when Merrill Lynch sold their stake in Bloomberg, to plug a hole in their balance sheet, and landed up in worse shape, sold to BofA. Maybe Reuters should be selling the entire firm. In tough times the breeding farms sell their top thoroughbreds and keep the plodders. It’s how Bob Baffert got where he is. Naughty Blackstone has been picking up some of Spain’s ways in their forray into housing there. I am trying not to laugh loud at the choice of name… infinite refi… if this does not start with a p and end with an i , well I don’t know. What happens if the fed raising rates just shrinks the money supply making it necessary to increase leverage on everything, including junk ? What if there just aren’t higher investment yields outside of government (self) debt. You cannot tempt investors with returns that are not there, only create speculation that they might be. No doubt, and not least of all because they are inflationary. To play this record again: right off the top, there is no US industry to protect for at least 60-70 % of Chinese imports. Then a bunch of Walmart stuff: toys, budget house and kitchen ware etc. Ex luxury niches, there is no domestic supplier. China’s competitors can fill part of the demand in apparel (only South Korea can help in TV with Japan now out) but Pakistan, Sri Lanka, etc. can’t replace the elephant in apparel. This is especially true in the more demanding area of shoes. So this winter either a whole lot of winter clothing doesn’t get purchased, OR, China is able to pass on most of the tariff. This is what has happened, so far, with the tariff on Canadian lumber. The only effect has been to raise the price to the builder. In this housing market, the US supply can’t meet its demand. But at least there IS a US timber industry to benefit. If the Trump tariffs boost inflation, the pressure on the Fed to raise rates increases, when it already was raising rates. So to bring this back home: all junk debt and this huge extra amount of junk debt is about to get junkier. Correction; Japan not totally out of TV. Toshiba out but Sony still in, mainly high end. The London Drugs here has one at $4500. All others Samsung or China. What have you got to lose really?? If the Fed’s Ponzi markets start to crater, QE4 is a given. If speculators are blowing off the Fed, it’s because the Fed has long since destroyed any credibility it might’ve had as a responsible central bank. I suppose if pensions have a 7% return assumption, they have to hold investments that earn 7% or the auditors will reduce the return assumption. The auditors either aren’t smart enough or honest enough to cite the increased risk profile as a problem that jeopardizes the return assumption. Let’s face it. Nobody is going to get 7%average return over the next 20 years. They are all lying so that their gravy train continues as long as possible. Taxpayers will be left holding the bag, and it will be sold as a “surprise”. The auditors that should be calling out this problem right now will make twice the money on the back end when the clean up occurs. It’s a corrupt system. Wow, when I read $13+ B dividend, I thought Wolf had a typo. This is insane. Who in the world actually invests in this stuff. I mean, the yield is higher, sure, but given the corresponding risks, there are still people who are stupid enough to bet money on this. I just couldn’t understand it until the obvious occurs to me. The only ones who are the losers in this mess are the ones who are putting in their own money, and usually they aren’t doing it on their own volition. It’s a case of some fund managers, may be guys who runs some pension plan. From their point of view, they still get paid, and they’re playing with other people’s money, if they win, they are heroes, if they lose. They are no worse off, and they still got paid. And I’m sure they have a dozen excuses ready to go. As for Blackrock, I’m sure there is some kind of kick back somewhere, Wolf would eat his shorts if Blackrock managed to lose money on this deal. The dirty ‘secret’ on the street is pension funds buy this garbage because they can show improved fund solvency on an actuarial basis and collect their bonuses for one more year. They know it’s garbage but so what. By the time it blows up they will be retired and it’s someone else’s problem. If it blows up sooner, well at least they got paid. The sales traders are just doing ‘God’s work’ and getting paid for it too! Two years after the Hanjin Shipping bankruptcy, lenders are still ruing the day they decided to lend the Korean shipping giant money at the rates they did. Assets are being liquidated at snail pace: yes, Hyundai, Maersk and MSC have bought a few of the most modern ships, but at a small fraction of what they were originally valued. Savvy Greek shipowners, who were supposed to buy assets hand over fist (presumably by somebody who doesn’t know what a hard bargain they drive), are bidding their time, stretching their purchases over time: they know the longer assets, be them ships, containers or whatever, sit idle, the lower the price. Unless the Korean government steps in even senior creditors won’t be made whole and junior creditors will get a pittance, if anything, after inflation is factored in. Oh, and Atlas Shipping (Denmark) and Nautilus Group (Bermuda), both specialized in charter shipping and leasing, are unlikely to ever emerge from bankruptcy. More bulk carriers and oil tankers going on the auction block, and more creditors ruing the day they lent money at the rates they did. All these shipping companies were dead men walking and, in other times, creditors would have demanded either much higher interest rates or far more solid collaterals than grossly overvalued bulk carriers. The inability to raise capital at affordable rates would have forced these companies to either make painful choices to turn their business around or into liquidation. Replace Hanjin Shipping with Tesla, Uber, Refinitiv, or any other poorly run business of your choice and you will understand why, to paraphrase The Usual Suspects, I always say the central banks’ greatest trick is to convince us risk doesn’t exist. Good point, MC. – “…convince us risk doesn’t exist.” – in other words, instill confidence. Confidence makes the world go ’round. What leader – businessman, politician, parent, priest, Fed chair – is willing to express real doubt? “Well, Johnny, there’s a decent chance that you’ll end up mopping the floors of slaughterhouses if you don’t do your homework.”. “Hey, folks, this whole fiat currency thing, at some point, is gonna go bust.” It’s not limited to insurance & finance. It’s the sinews of culture. Just more egregious in some areas than in others. This is not a so-called confidence trick. Risk is what ultimately drives interest rates: investors have to be compensated for their willingness to take these risks in proportionate fashion. That’s why returns on the Asian trade during the Age of Sail were so high (400% on a single return trip was not uncommon): the risks were enormous, especially before reliable methods of longitude measurement were developed, as proven by the large number of VOC ships lost on the Western coast of Australia. But how do you price risk in our present environment? Can you even do it, when central banks have taken upon themselves (despite lack of mandate) to distort the risk assessment mechanism? One can argue in our present age taxpayer-funded bailouts, emergency loans at record low interest rates and politically motivated mergers and takeover have canceled risk but it’s a naive proposition, on par with the Chinese government being able to slowly deflate any of the bubble its own policies created merely by issuing decrees and jailing people. There’s an episode of the Penguins of Madagascar cartoon in which the titular characters clone an extinct dodo bird back to life, only to discover that due to living on an island with an agreeable climate and no natural predators it has evolved to be utterly fearless “in the most stupid way possible”. That’s a good parable of what I am seeing today. WSKJ, my Professor of Classic Greek from the lycée would like a word with you, as he was adamantly sure your adventures dated “no later” than the XI century BC. I’m also going with “c. 800 B.C.” for Homer, aware that your professor at the lycée would likely also find fault with that date. Nice round, even numbers: 1200 B.C. for the war and the odyssey, 800 B.C. for Homer; and I think I’ll add on 1600 B.C. for the eruption of Thera; and 2000 A.D. for der untergang des abendlandes (sarc, I hope) …all nice round numbers. I realize that I am OT here, Wolf, so I will say that if we don’t remember some of these events, we are likely to do worse going forward (your studies are all about how the present fits onto the graphs of past economic/financial cycles). Thanks for your commentary. I wish that I had a neighbor such as yourself. So this is where all the risk has slided. It’s not Mortgage backed securities on subprime mortgages anymore. This time the name of the game is “Covenant-Lite”. Rising interest rates = ???? Looks like Moody’s isn’t playing along with a seal of approval. Doesn’t that handicap fund managers’ ability to seek yield? No one cares about the down side because they know that when the next crash occurs. The Fed will bail them out. Two weeks ago, an economist from the IMF even proposed that in the event of a stock market crash. The Federal Reserve should buy stocks. Yes, and the certainty that the FED will bail them out may be the greatest risk of all. So I just don’t understand. It gets bought because if offers 6% or 7% yield. Currently, the spread between Treasuries and junk bonds is historically narrow. In other words, investors are not getting paid adequately for taking those risks. This has bad outcomes. I write about “spreads” occasionally. The Fed is really worried about these tight spreads or “risk premiums.” They want those risk premiums to widen. But that just hasn’t happened yet. Au contraire. Why? Because these institutional investors have been driven to insanity by ten years of yield repression. Wolf, I could not agree with you more about the spreads. These 10 years of QE and FFR suppression have had such massive effects in the risk quantification aspect of interest rates, that there’s no longer any sensibility in the fixed income market. Many people do not recognize how profoundly distorted things have become. A 6-7% yield today invites complete and utter reckless abandon, because the markets have been systematically conditioned over the last 10 years of ultra low interest rates. It’s all quite a mess and a perfect example of market and behavioral distortions that lead excessive risk taking in real terms. There will be a strong bid for a 6-7% yield regardless of quality. Could you please confirm if my understanding of the spread, given below, is correct. Good times (bull market) – spread is low – which means that perceived default risk is low due to which investors do not differentiate between IG and Junk bond and go for the junk bond for even small higher yields. Bad times (bear market) – spread is high – since perceived default risk is high. If the Fed in trying to engineer a wider spread succeeds, is it possible it can create a contagion in the bond market starting with the junk bond and create a credit freeze? Is the gradual approach to help in the market being able to digest the higher yields and thus avoid a credit freeze? Yes, I think you nailed it. Your definition covers at least part of the dynamics behind the spread. “Bull market” generally may be too broad. “Risk of default” is something credit agencies rate, so these are known, and investors see those ratings – but in a bull market they don’t care, and in a bear market they bite their nails over them. There are other elements involved too – “yield chasing” being the biggest one (this is part of a bull market in high yield). The Fed wants to bring asset prices down (and yields up). The Fed is concerned about the pandemic yield-chasing in the high-yield market currently. Even Yellen has pointed this out starting a couple of years ago. Yield chasing is very risky and when it reverses, it can cause upheaval in the financial system (via grossly overvalued collateral!). So the Fed wants to tamp down on it. Yes, once the medicine takes, these yields will be shooting higher, and there will be defaults, and that will hit stock prices of those companies. This is what happened in the energy sector in late 2015 and 2016. Credit did start to freeze up for some energy companies, with CCC-rated energy yields shooting past 20%, and there were some defaults. But it didn’t take long before PE firms and hedge funds plowed billions into this sector and made a ton of money on the surge since. A credit freeze – the far end of the spectrum — for high-yield companies is not what the Fed wants though it can tolerate it if it doesn’t go further, knowing that Wall Street will solve that problem, as it had done for energy. It wants to tighten credit, and creating trouble for overleveraged junk-rated companies is part of the deal. If high-yield gets in trouble so be it. But when a credit freeze starts impacting investment grade credits, to where they cannot raise funds anymore, the Fed will step in. Its gradual approach is designed to avoid those extremes. So this is a media company? Are media companies being split up? CBS has been on the downhill trajectory for twenty years. FB is a media company? (under more scrutiny over manipulation) Google? That a matter for FCC isn’t it? Media companies have a bulletproof image, but that is changing, and the cost of doing business, as Zuckerberg has said. Financial analysis is going the way of technical analysis, because there is only one kind of inflation (asset) and and that is monetary. Reuters probably did the right thing. The market goes up because money is being made faster than shares of stock and buybacks expand market cap. All other measures of valuation are secondary to money printing. This is a data company, like the part of Bloomberg that does the Bloomberg Terminals. So whose money is actually at risk? Is Blackstone, or some of the billionaires who work there, actually putting up money, or are they just organizing the consortium and collecting fees? I see the Canadian Pension Board and the Government of Singapore are among the big punters. When the whole shebang slides into the abyss the financial data and reporting gets a big boost in users/viewers. Perhaps that is what the “investors” are counting on to get revenue off of flatline.